Istanbul, Turkey 1 December 2017 The fifth meeting of the Quadripartite Steering Committee chaired by the Government of Afghanistan was held in Istanbul. Turkey on 1 December 2017. 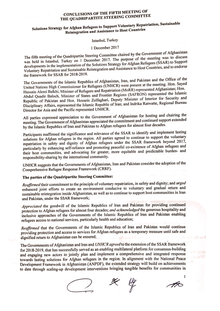 The purpose of the meeting was to discuss developments in the implementation of the Solutions Strategy for Afghan Refugees (SSAR) to Support Voluntary Repatriation and Sustainable Reintegration and Assistance to Host Countries, and to endorse the framework for SSAR for 2018-2019.